What’s going on?! What is this? Christmas in Jasper is a COMPUTERIZED Christmas Light Display in Jasper, TX. Our lights are synchronized to music which is broadcast to your car radio on 101.5FM (SantaFM). Stop by and see the show at 601 Live Oak Rd, Jasper, TX. Please turn off your headlights so you don’t disturb the other vehicles watching the show. PLEASE do not block any driveways and allow traffic to flow smoothly on our street. Thanks so much for your cooperation as it will help us continue this display in the future.Please stay back from the display. There is High Voltage present even if the show is not running. Where are the lights located? The lights are located on Live Oak Ln in Jasper, TX. Here is a map below. 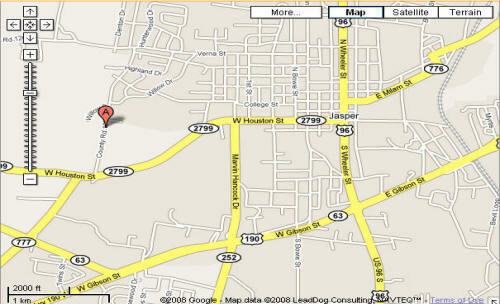 Click on the map to get directions from your location. Feet of extension cord used in display: Over 1200ft of extension cord. Feet of lights used in display: My calculator won’t count that high! Number of lights used in display: Current count is just over 14,000 lights. I use a controller called a Renard16(xmus). It allows me to dim/control up to 16 different things at one time. This year I am using 6 of the boards for a total of 96 Dimmable Channels. The controller was developed by some GENIUS Do It Yourselfers over at Do It Yourself Christmas. I had to solder the individual components on the board and get everything running. Below is a before and after picture of one of the xmus boards. The Renard 16 is a PIC microcontroller based Christmas light controller with 16 solid state relay circuits incorporated into the board. Dave Johnson (xmus) designed the board based on the PIC-based 8-port dimmer concept originally developed by Phil Short. Information on the original concept can be viewed here. Generic information pertaining to current Renard designs (including maximum channel count) can be found on the Renard wiki page. Who put the display together? The display was created by myself, and my lovely patient wife. I saw the display in 2006 in Lumberton and loved it. I decided this was something I wanted to do myself, and I did. This is my first year putting on the display. Christmas is a magical time of year and going to see animated, dancing Christmas lights is all part of the magic! And as always, please Remember the Reason for the Season!! !